Hello from the Philippines! I’m Sheila from Japan Foundation, Manila, one of the newest members of the Blog Team 2012. 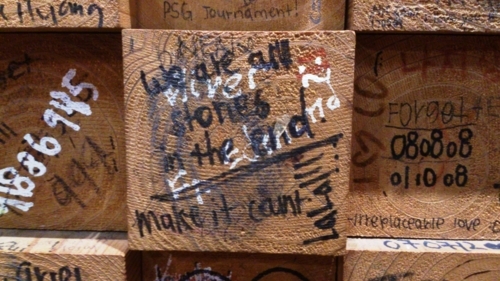 We came upon this writing (or should I say graffiti) in a restaurant in Singapore two weeks ago. I was already thinking on what to write in my first blog and my sister suggested using this as my inspiration. Let me share our stories from Manila. July is probably one of our busiest months in JFM. Besides the day to day activities, the office was also busy with the events for the Philippines-Japan Friendship Month. One of the most anticipated events during July is the Eiga Sai (Japanese Film Festival). This year’s opening film was “Akunin” (Villain). Choosing the opening film for this year’s film festival became a big challenge for the office; “Departures” last year was such a huge success that we knew we had to have an equally powerful film to open the festival. And we weren’t wrong; the film was well applauded and was the perfect opening for the month-long celebration. The next event in our Friendship Month calendar was the traveling exhibit, Sharaku Interpreted by Japan’s Contemporary Artists. The exhibit was a fascinating mixture of Sharaku inspired original works from the Japanese contemporary artists and the Sharaku reproductions by the Adachi Institute of Woodcut Prints. 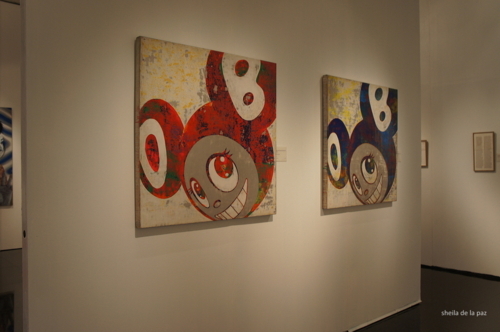 The audience was not only treated to works that have fascinated a lot of people from other countries but they also got the chance to do some art through Tsuyoshi Ozawa’s “Sharaku Work”. 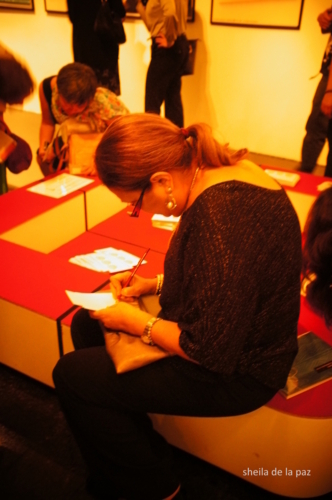 The audience was provided with postcards with drawings made by the audience from other countries and a blank postcard; they were then asked to draw the face of their favorite person. These postcards were then placed inside envelops which will be brought to the next country that the exhibit will visit. It was quite amusing to see the guests concentrate on doing their drawings and seeing the look of joy (or is it misery) at their finished masterpieces. 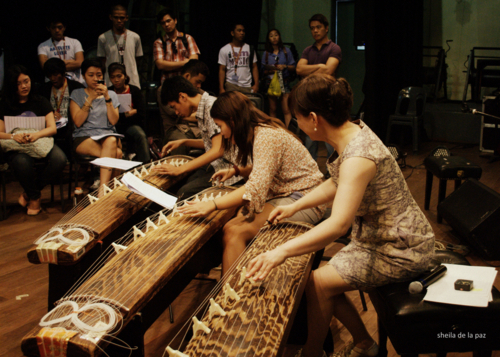 Another event that we had last July was the Aki & Kuniko Concerts and Workshops. We were very lucky to have the acoustic duo back in Manila not just to perform and wow the Filipino audience with their exquisite music but to also share their craft, experience and love for music through their workshops. 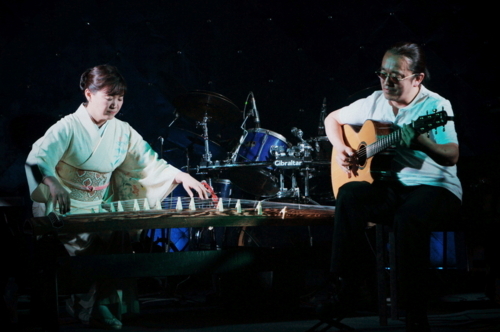 The duo was able to give the students a peek at how they were able to combine koto and guitar to create music that is distinctively Aki & Kuniko. After 3 cities, 5 concerts, 2 workshops and endless hours of traveling (and waiting in airports), the project was indeed exhausting but like all events, the welcome and applause given to our artists, the interest that the students showed during the workshops and the feedback that we received after and makes all the work (and traveling) worth it. More stories from Manila soon.